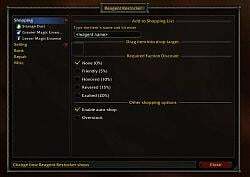 Reagent Restocker is a simple addon for automatically purchasing items, selling unwanted items, and repairing. 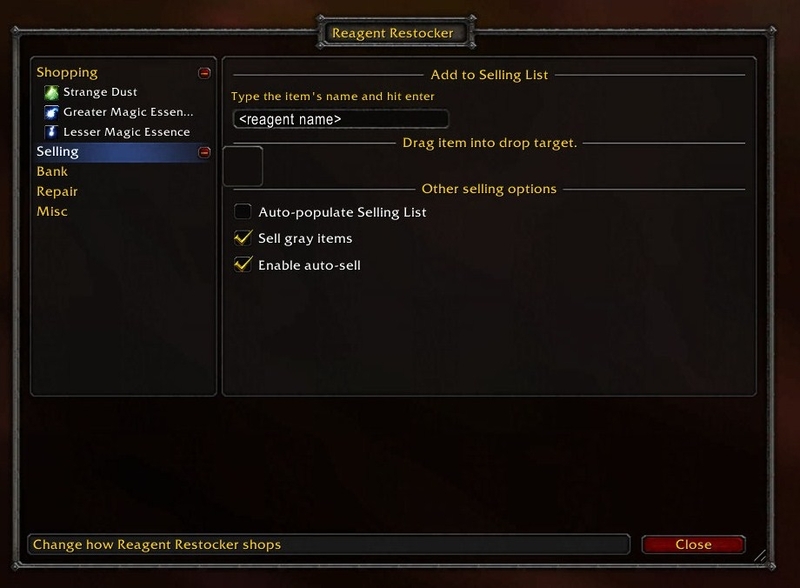 Unlike many other similar addons, Reagent Restocker supports drag and drop and has a full GUI for editing buy/sell lists. If you like it, feel free to donate! I highly recommend donating to your favorite addons, it really helps. If every person who downloads this addon donates as little as $1 per month, I could actually work on this addon full time. As it stands, however, it's actually kinda hard to justify putting much time into it at all. Reagent Restocker now has Google+ and Facebook pages! News, notes, and patch releases will be posted to Google+ and Facebook. NOTE: I've been seeing copies of Reagent Restocker popping up at other download sites. The only three places I currently upload the addon to are curse.com, wowinterface.com, and solidice.com. I cannot guarantee the integrity of any other download sites. Automatically buy items from vendors. Automatically sell items you can't use. Warn you when you're getting low on items you automatically buy. Use LDB to show your current stock of items. Automatically mark items in ArkInventory as trash (Note: This feature is maintained by the authors of ArkInventory). Access it via the minimap (must have LibDBIcon installed). When automatically buying water, it can automatically update the buy list to the latest usable water by your character. Stock excess items in your bank or the guild bank. Control buying/selling/repairing based on vendor discounts. Devs wanted! It's open source, and I've been busy with other things in real life. I'm willing to add more members to the team. Must have a CurseForge account. If you have LibDBIcon or a LDB compatible bar installed, you can access Reagent Restocker simply by clicking on the icon. Otherwise, you can access it via slash commands. To start using Reagent Restocker, type /rr at the command line. /rrstock and /reagentrestocker also work. Raid Roll users: Reagent Restocker may take over /rr - if that happens, use /rrl for Raid Roll. The primary portal for Reagent Restocker is at curse.com, even though I also publish the addon to wowinterface.com (the old portal) and solidice.com, and may publish to other places in the future. While Reagent Restocker is an open source addon, I do take donations. Updated website to WoW Interface until I can regain control of my curse.com account. Sorry, that's all for now. Code cleanup, prints message that reagents have been deposited into Reagent Bank. Fixed automatic moving of reagents to reagent bank. NEW: You can now instruct Reagent Restocker to automatically move reagents to the reagent bank! The new option is in the "Bank" section, and is off by default. Moved documentation to Markdown. Compatible with Curse, and easily exported to WowInterface and SolidICE. Removed guild level code, since that functionality has been removed as of Warlords of Draenor. Official release for patch 6.0.2. Updated for compatibility with Warlords of Draenor beta. Sorry for the infrequent updates. This is a volunteer thing, it's hard to give it a lot of time. The ability to keep Soulbound and Bind on Equip items is BACK!! After a rather lengthy debugging session and the help of the Blizzard forums, I was finally able to track down and fix the bug that was preventing tooltip scanning from working. Relaxed the restriction on guild bank withdrawls. Reagent Restocker will now use all except the last withdrawl for automatic processing. Changes made to event processing in an attempt to make overstocking more reliable. Added monks to automatic selling of useless items. Profile support added! Now you can save, load, and remove profiles that are shared between characters! Updated database to use names instead of numbers everywhere. Added Facebook to "About" section. Simple and flat is in - Reagent Restocker has a new icon. Works better for the larger minimum photo sizes that Google+ and Facebook are requiring, and has a slightly lighter blue for more contrast with the black border. Updated TOC for most recent version of WoW. Since this is a non-code update (mostly news and TOC update), only incrementing the minor version number. Found a computer to test WoW with, so I can still code in a limited capacity. Hopefully fixed database upgrade bugs. NOTE: This is the last update for a couple months. I am moving, and my computer won't be available to me for a while. Fixed potential error in UI. Fixed: Caged battle pets would cause an error. Ugly window is . . . less uglier. Still not where I want it to be yet, but making progress. Added database consistency check, which will run once for this version. Can also be activated manually. Remove rogue poison warning from description. Apparently they don't use reagents anymore. Fix playerEnteredTime bug. Not a complete fix, but should stop the error. Despite switching to a "Chrome like" version numbering, this seems rather minor, so don't increment major version. Withdrawing World of Addons support. Alas, they are not acting legally. See the Google+ page for details. Allow players to disable the new UI. I reserve the right to remove or reset this option eventually when everything is finished. Allow enabling of debug logging. Note that this is EXTREMELY spammy and may affect the performance of the game. It is is used for my own debugging purposes. What appears in here can be pretty much any debugging info I need at the time. Version numbering based on Google's Chrome browser is now in effect. Expect the "major" number to be updated more often. I don't think I'll be updating as fast as Google, though :). This version will be uploaded to World of Addons when they confirm my claim to ownership of Reagent Restocker. Updated to Ace 3 r1059. Worked with author of Ace to resolve the issue. This also fixes the known bug with missing buttons. If all goes well, Reagent Restocker 3 will be released on Monday. That way, when the servers are back up, you'll be ready with a new version of Reagent Restocker :). And for the second time in Reagent Restocker's history, I'll be changing the versioning again. Going to a Google like system. Major number will be public releases, minor number will be betas. Alphas will stay the same, as Curse controls the version numbering of alphas. This will start with Reagent Restocker 3's release. Changed all instances of UIPanelButtonTemplate2 to UIPanelButtonTemplate, for compatibility with Mists. Re-added items in "About" menu. It was a genuine bug on Blizzard's part that they stopped working. Updated TOC to indicate compatibility with Mists. KNOWN BUG: The buttons to remove items are missing. This is because the included version of Ace3 is incompatible with Mists. Ace3 update may happen later rather than sooner, as updating it breaks Reagent Restocker. Fixed drag and drop not working with merchant. UI2.lua wasn't included in the previous betas, added. New frame now has scrollable list, buttons that will eventually become tabs. New frame can be used to add/remove items from the different lists. Defaults to the Buy list. Further work on new frame. Sorry it took so long to get back into it, it's hard to do a lot of programming these days. Back in beta for new functionality! Preliminary Mists of Pandaria beta fixes. The little +'s that appeared in the UI are gone, and unlikely to come back. Working on new frame for merchants. This will replace the little "+" symbols, and allow you to access RR right from a merchant, rather than from the rather klunky window used by the Ace libraries. If this works, it will eventually lead to Reagent Restocker 3. As a result of fixes for MoP, some of the information in the "About" menu is missing. I'll bring the info back when I have a fix. Removed debug statement that was causing an error. NOTE: Ace added new files, you have to restart WoW for this update! Minor UI layout changes. Ace has new features! I may use them more in the future. Updated news page, I think it was a bit too long, needed to be simpler, and needed to be more focused on what Reagent Restocker does. Removed Flattr button from news page, nobody was donating regardless. It's pretty tough getting donations. I'll just stick with the built-in donation system. You can still Flattr Reagent Restocker by the donate link on the Google+ page, or directly from the Flattr website. Reagent Restocker shouldn't try to place things in special bag types. For now, BoE, Soulbound, aren't gonna happen. Instead, limit what is automatically sold by item quality. Attempt to fix sandboxing bug. New icon! The icon for the single LDB icon has been changed from an in-game icon to a custom icon. Comments welcome. Original SVG included - created in Inkscape. Updated TOC for 4.3. Seems to be working fine. Added compatibility information for Addon Control Panel. Reagent Restocker now has a Google+ page! Added to About page. Reagent Restocker now detects when an item in its database is outdated. 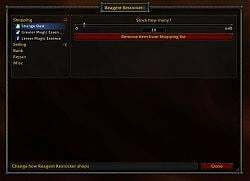 If you see "(outdated)" text next to an item, it might not be in WoW anymore. Reagent Restocker wasn't searching the bank itself for items, fixed. Receipt tweaks. Still needs more work. Required discount is now reputation. Messing around with formulas turned out to be totally unnecessary. Keep It Simple. BoE and Soulbound detection disabled until it can be fixed. Sorry, it never really worked anyways. Fixed water not upgrading to current player level. Fixed not displaying the cost of repair. Trying to account for guild perk "Bartering" again. Fixed sometimes not being able to add items to the list via text box or rrbuy/rrsell. Finally figured out what was causing the water upgrading bugs. Fixed. BOE / Soulbound bugs not fixed yet. Removed "TotalBiscuit approved!" from top of changelog. He doesn't play the game anymore anyways, and honestly my quality has been lacking the past few releases. Hopefully fixed issues with slash commands not working correctly. Fixed error with opening guild bank. Fixed profit calculation when repairing. Water upgrading and BOE/Soulbund bugs not fixed yet. Fixed libraries not loading if it's the only addon loaded. Fixed "attempt to index global 'RRGlobal' (a nil value) ". Required a new event system that handles Lua environments properly. Attempt to fix error involving RRGlobal. Reverted a change to buying based on vendor discount. Need to invetigate the "Bartering" guild perk a bit more. Fixed some code that was creating an error when it shouldn't. Fixed colors appearing as strange numbers and letters in "Quality to sell" slider in selling options. Possible fix for an error. Item stacking should now be a little bit better when automaically withdrawing/depositing items to/from bank or guild bank. Still working on it, though. Lots of changes to the code dealing with banks and guild banks, hopefully fixing a lot of issues. Unfortunately, there are still some remaining bugs, but it should be better. Reduced loading time when database doesn't need an upgrade. Reduced memory footprint by unloading the database upgrade code after it's finished or if it isn't needed. Probably isn't much, but the upgrade code is getting longer with each database update. Decided that recording debugging messages constantly even while not debugging shouldn't be done, as it's essentially a memory leak. Rewrote a lot of item queueing code. There's a lot of junk commented out increasing the file size a bit, but I'll clean that up soon. You WILL need to restart WoW for this update. Don't attempt to upgrade while WoW is running. Forgot to turn off debugging!! Fixed receipt message appearing when there is no receipt. More code in different files, to make things a bit easier. Rolled back the really buggy rewrite of the bank code, moved it into a new file. Then rolled it forward again, as I've changed too much to be able to roll it back without consequences. There are some extra, unused files as a result, which I'll delete when I'm sure everything is working. Fixed print statement claiming gear has been fixed when it really hasn't. Again. Hopefully this time it's really been fixed. NOTE: There are still some known bugs in this release, in particular when it comes to moving items to/from the bank. They're some pretty tough bugs, but I'm working on them! Telling it not to repair with own funds after a guild bank repair fails should work now. Hopefully now correctly accounts for the guild perk "Bartering" at level 24. My guild is NOT at level 24 yet, so can't test it!! Fixed print statement claiming gear has been fixed when it really hasn't. Well, it's been tested enough as a beta, releasing as stable. Database changes towards the goal of making it easier to work with. Adding items by typing in name was broken. Fixed. Fixed item caching issue accidently adding items to item list. New option to automatically upgrade water. Bug fix creating new database. Updated toc file this time. Fixed bug 68 - Selling items doesn't always give receipt. Extra database integrity checks and fixes. Should be the last of the known bugs - please report if you find more! Fixed 55 - Lists not updating immediately. As far as the UI is concerned, buying and selling is now based purely on the tag system. Hopefully this should clear up some weird behavior and bugs. Test release - 2.5.3. Let's see how this repository thing works, eh? Unified file loading into the XML file. Lots of file restructuring, to make future development easier. Less reliance on Ace libraries. Debug printing now a different color (not visible unless debugging is turned on). Beginnings of a testing framework. See if I can do some test driven development for better code quality. Fix crashes when adding/removing items from lists. Fixed some cases of "You are attempting to begin too many transactions in a short time" - hopefully it won't break anything else? Fixed buying items that use alternative currencies. Adding alternative currency support would likely be complex, so for now they're not supported at all. Moved BoE and Soulbound checks inside of API function for more accurate reporting to other addons. Removed more commented out and unused code. Decided I'm moving to the tag system - it's fast, effective, and works. It's a bit of a space/speed tradeoff, but it should allow me to remove some deeply nested loops that hurt performance. New: Reagent Restocker now has access to a database shared between characters, currently used for global caching and will eventually make copying lists between characters possible. 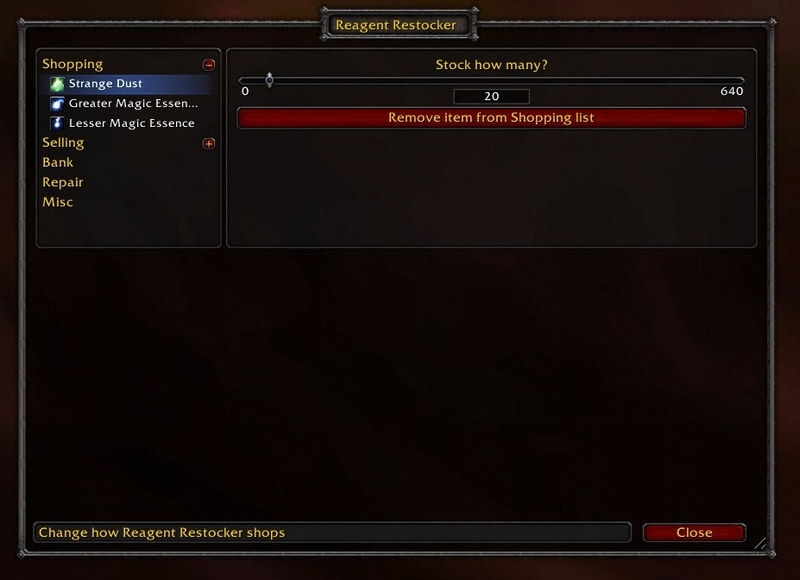 The Reagent Restocker LDB item is now always available. Added support for launching Reagent Restocker via a minimap icon (requires LibDBIcon-1.0). Started work on support for guild bank. Unfortunately, due to technical reasons, it's gonna take a while to get it implemented. Lots of new stuff, likely lots of bugs, so make this a beta. Option for automatic adding of items to selling list moved to misc menu, in a less prominent position. I really want to discourage using this feature. WARNING: This update includes rewriting some of the base code, which was needed to make the guild bank feature possible. Some behavior may have changed for restocking to/from the bank. Bug fix: Don't sell items in buy list. Removed garbage collection calls. The tooltip issue is fixed and the code is a bit more optimized now, it shouldn't be a problem anyways. And it's just plain better programming to let the incremental collector do its job. In any case, CPU usage affects performance a lot more than memory usage. If you're hitting the swap file a lot with an addon that only uses kilobytes or even a few megs, you have bigger problems and the addon should be the least of your worries. Collect garbage after loading/upgrading database. Performance tweaks and memory usage tweaks. Commented out more unused code. Check for existing LDB objects before creating new ones. Should reduce delays, use less memory. I am aware that there are still some memory issues, I am trying to find them. Receipt code now uses several lines instead of one big message. Started some new code for receipts - the plan is to eventually allow players to be able to keep previous receipts (optional, of course). Not available in the game, but may affect download size. New features: Don't sell soulbound or bind on equip items. I went into the deep, dark depths of tooltip scanning. Not an easy thing to do. But I did it. This also means I can scan for other things in the future :). Got the message loud and clear on the new receipts - reverted some of the code until I can have something better and more complete in place. Added ability to automatically sell higher quality items. Added ability to automatically sell food or water. If you want two options (one for food, the other for water), you MUST have the Periodic Table library (version 3.1) installed. Otherwise, your only option is to sell both or none. Upgraded Ace to current version (r981) to fix some bugs. New feature: You can now add items to the shopping list directly from a shopkeeper's window. Receipts now open up in a new window rather than being dumped in chat. In the future, I may add an option to save them. Various UI and code tweaks. Forgot I was using the even/odd version numbering system. Fixed broken faction discount description. Code reduction: Removed some uneeded files. Added option to automatically sell unusable armor/weapons. WARNING: Mostly untested! I don't have characters of all classes. Based on WoWWiki's tables. Doesn't work for relics. Fixed a minor spelling error. Fixed bug adding items to exclusion list. Happy Thanksgiving to those in the USA (or anybody else celebrating a similar holiday) :). Updated TOC - I tested it in Cataclysm beta, it works. Removed beta tag to make it the official current version. It's stable, even if it's not where I want it to be. Removed options to show debugging info and the "new UI" which might not happen anyways. Added UI info to "about" info. Fixed Cataclysm bug due to API changes. Added Ace info so I know what RR's currently using. Reworked global function calls, hopefully for a reduced memory footprint. Beginnings of new UI - NOT FUNCTIONAL! Only available using a button from the old UI. Automatic destroying of items fixed. WARNING: Destroyed items cannot be recovered. It should show a dialog box before destroying items. First attempt at automatic destroying of items - dialog box appears, and function tries to run, but for some reason it won't work. Found new method of detecting whether a vendor is willing to buy an item - hopefully, this will fix a bug and enable a new feature in the future. It's about time I used tooltips rather than relying on Ace3's status frame, which always has a bad habit of chopping off the text. Attempted to fix bug where stuff wasn't being added to the exceptions list. Added a bit of database cleanup code, should improve the loading performance for some people. You will need to install this update, load the game, quit the game normally (no crashes or force quits), then load the game again to benefit from this. Swatted a bug. D.E.H.T.A. is angry. Seems pretty stable, so make the middle number even. Added sorting to item lists. ** ReagentRestocker:deleteItem(item) < UI now uses this, so it should be hookable. Except for the exceptions list, all lists now show the UI for the item when it is added to a list. Clears UI when an item is deleted. Added titles to the UI if the items when they are selected. Helps a bit when debugging as well. The ArkInventory addon author is looking at adding support for Reagent Restocker! Unintentional source of data corruption found and fixed. A bunch of UI cleanup. Easier than I thought, actually. It was just trying to pull in some functions that it wasn't using anyways. Attempt to fix a bug. No news is good news. I'm pretty much assuming the "low reagent warning" bug is fixed now. Fixed crash when quantity wasn't set. New list: Exceptions. This lists prevents the automatic selling from selling certain items. Some functions made available in a public API. This was a pretty big change to the code (in order to make more lists possible), and a lot could be buggy, so I'm gonna increment the middle number in the version. More tweaks to the low reagent warning. Note that it only warns when items become low while using them, it doesn't warn of low items when entering a city or anything like that. I just got a big DUH moment - the warning was deeply nested in a "for" statement, making it conditional on things it shouldn't be conditional on! Fixed. Hopefully, this fixes 99% of the weirdness of the low reagent warning. Fixed an unintended crash when dragging and dropping an item onto the text field. Probably in there as a previous experiment to add drag and drop? As a result of fixing the bug, you can now drag and drop items on the text field to add them to the list. Note that it may not be reliable. Added a bit of new debugging code - puts more information in crash messages. Another attempt to fix low reagent warning. Tried to fix reagent warning not appearing at all. Explanation of the bug I'm tracking down: It seems that when WoW first loads, the inventory will act as if there's nothing in it. Therefore, if I check for low reagents right away when RR loads, it will detect them as low and give the player a warning. In 2.0.6, I've been telling it to ignore them until a certain event happens which seems to tell me when the inventory is available again. Alas, the event I chose doesn't always happen, so I've added another event in an attempt to make the detection more reliable. Alas, there is no documented "correct" event to check for this, so it's largely a shot in the dark. I'm hoping this is the last I see of this bug, but no complete guarantees. Please report it if it happens again. Fixed database bug that could cause crashes. Fixed bug that inappropriately warned reagents were low after a loading screen. Why yes, if I compare it to nil, I want to know if it's nil. Get rid of some debugging messages that were just causing errors. Added delay before checking for low items in an attempt to avoid a bug. Fixed a bug where a debug message was being displayed inappropriately. Added option to disable low reagent warnings. Attempted to fix warning that something is low when it isn't. Fixed a bug when loading the database. Started some code for a new feature. Added bug reporting link to About page. Fixed bug where the merchant refused to take the item, but still counted as being sold, resulting in inaccurate selling profit. Added warning when item drops below an amount set by the user. Compatible with Mik's Scrolling Battle Text. Apparently, the old way of just detecting the slash command conflict stopped working. Thankfully, the Raid Roll author added a way to detect that it's been loaded. Library and code cleanup - removed unneeded stuff, should make download smaller :). Waterfall is no more. Ace3 is now the primary driver of the UI. Fixed bug where bank itself wasn't included when stocking to/from bank. To prevent people with large lists from having an explosion of LDB items, it now defaults to only a single item. LDB: Now loads icon for items when a new LDB object created, rather than loading the icon later - fixes bug with some plugins. Added option to use text instead of labels - some LDB plugins don't support labels. Closed all bugs. Unfortunately, one I wasn't able to reproduce :(. If it happens again, the workaround is to just visit the vendor again. Please record any errors - sometimes the error will appear in a chat message. Start tracking Reagent Restocker version in database - may help if I want to change how the database works in the future. If nothing major is reported, this is likely to be the last beta. Well, as far as I know it's stable. Barring any new major bug reports, it'll go to stable, which will be released as 2.0. Made sliders act more like they do in the 1.2.x code. Fixed typing in the numbers in the sliders. Erased some debug prints. Debug printing still turned on for the beta testing, though. Fixed checkmarks not working. Placed something in the wrong argument for a function. Fixed checkmarks not working. Hopefully this time they're really fixed. Yes, updates are rolling in rapidly . . .
More bug fixes. Testing on my main now. Fixed loading bug when Ace3 is loaded and LDB is absent. Major bug fix: Now loads database properly. Now sliders go their full length. Released as beta! Please test, please report bugs! Finally got everything I wanted to get working, working. Integrates with WoW's addons tab in the interface menu. Updated toc to current patch version. It's been a long, hard road, I hope it's worth it. Finally, I can get back to playing the game and fixing minor bugs. I accept donations, go to the website and find the donate button. VERY EARLY ALPHA/BETA - VERY UNFINISHED AT THIS POINT!! Various bug fixes, working on reducing name clashes. Known bug: Frame intended to be inside Blizzard's UI appears underneath it. Fixed case where, when Raid Roll loaded after Reagent Restocker, it would wipe all three slash commands. Not really Raid Roll's fault, it just appears that when you register slash commands as a group, overriding one wipes the others in the group. Solution was to register "/rr" separately. Attempt to fix some icons not showing up. Added option to use a single LDB object instead of one per item. Detect Raid Roll, and do not override its slash command if it has set one. Added /rrstock to the slash commands. Same as /rr. 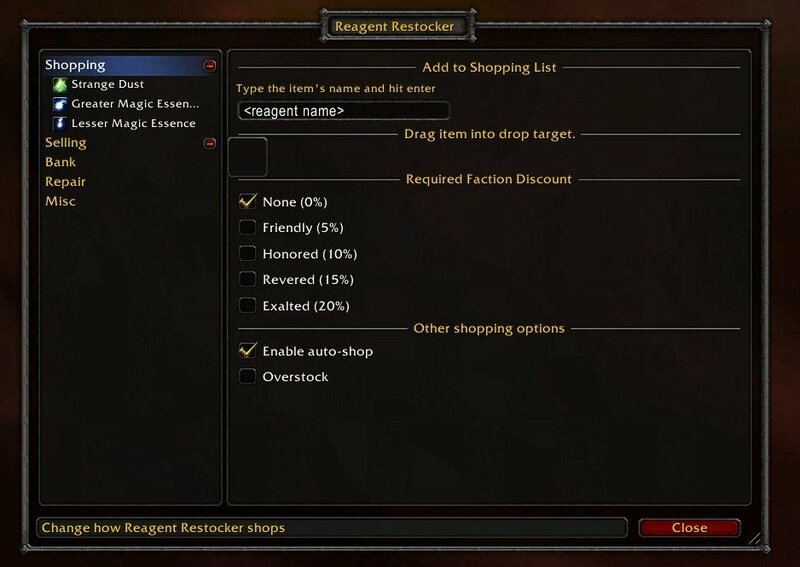 Remember, you can always use /reagentrestocker to open reagent restocker. No more crashes reported, only minor graphical complaints, so releasing as stable! Waterfall was acting up, so I jailed it. In other words, it runs in its own environment now and doesn't pollute the global namespace. Hopefully this should be the final fix for incompatibilities with other addons. If you come to a fork in the road, take it. Or, in this case, if you modify a library, fork it. With a new day for a fresh set of eyes - a some "if" statements and "function" closures in my code were closing in weird places. May have been responsible for flaky behavior and performance issues. Fixed. Minor UI and LDB bug fixes. Add some text to LDB feed. Increase intensity of colors at user request. Increased visibility of resize handles. Give Cheeken credit in TOC. Hopefully fix vendor discount bug. Versioning set to be more Linux-like. This is still a beta release, so odd second number. Drag and drop support now added! Easier, and more reliable since no dependency on the name. Rquired modifications to the Waterfall library. Consider the library branched . . .
Wider area for longer description viewing. May adjust more in the future. Formatting of news and changelog adjusted to be more Wiki-like. Added MIT license to code. Added /rrbuy and /rrsell to add items to the sell and buy lists (thanks g3gg0). Per the advice of rerunx5, replaced LibStub with Ace 3.0 LibStub. First change with new author (CobraA1). Increased maximum shopping quantities; should allow players to fill some of the more specialized bags. Changelog and news now included as text files in the addon. Note that I have not updated the interface version yet - I want to make sure most of the known bugs are fixed first. The Bad News: Due to a significant code rewrite, v0.6 will reset your settings. You will have to re-enter them. The Good News: Reagent Restocker now has limited bank support. Enable the appropriate options and Shopping List items will be pulled from or deposited into your bank. Also a few other handy features were added, such as auto-population of the Selling List. Reagent Restocker has been updated! 10.3 is out now on WoW Interface and Solidice. Unfortunately, I am still in the process of trying to recover my curse.com account, and it will not be available at that site until I can work out account recovery with Curse. The update mostly consists of updating the TOC and fixing some reported bugs. The reason for the update is because somebody donated, and I have some vacation time. That said, there is little incentive to continue working on the project as I don't play World of Warcraft anymore. I am still looking for a developer to continue the project. Due to financial hardships, I've cancelled my sub. I can proabably still test the addon on a low level char with a free account, but you may have noticed a lack of updates. World of Warcraft is no longer my focus, I rarely play it anymore. I'm aware of the current bugs and will try to find time to fix them. A new addon is born! Hey everybody, just thought I'd announce a new addon for those who don't want the entire Reagent Restocker suite to deposit Reagents into the Reagent Bank. It's a simple, minimalist addon that takes almost no memory. 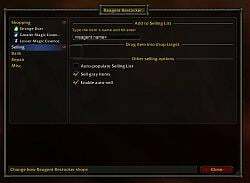 The addon is called AutoReagentBank, and can be downloaded from Curse or any of the other usual locations. Last edited by CobraA1 : 11-26-14 at 12:01 PM. It's been a while, and I haven't worked on Reagent Restocker in a long time. Addon support has just been added to the beta in Warlords of Draenor, so it's prime time to get started working on it again. Relearn the code - sadly, I've been out of it for a while, I've probably forgotten where everything is . . . Prepare Reagent Restocker for Warlords of Draenor. Already it needs some work, with one of the libraries crashing. An update for the library just came out that fixes it, so I'm going to release a beta of RR very soon to fix that. Rework the UI, especially the "new" UI. It never seemed quite right. I'm gonna shoot for a flat look, which requires less artwork and should be easier to work with. Use what I've learned from working with Lua as a full time job to make it a better addon. Kinda vague right now, but I've learned a lot, and should be able to apply it as I work with the code. So I'm back . Hopefully I can get things done. Last edited by CobraA1 : 07-20-14 at 12:37 PM. Can't get RR to buy any of the noodles from the noodle carts. Different merchant events for a player controlled vendor perhaps? Apologies for not getting much done. There's some mixed news as far as the future of Reagent Restocker goes: On one hand - I'm actually working for Zygor Guides! Working on Lua full time now. Which means I'm learning a lot, and that could potentially help out Reagent Restocker. There's a few things I'd like to change going forward. On the other hand - I'm pretty burned out after a hard day's work, and I generally don't want to be in World of Warcraft for the rest of the day, much less doing more programming for it. Perhaps during the holiday season I'll see if I can do more work. But for now, I'm just updating the TOC and fixing occasional bugs. Check out version 8.0 . The 'keep BoE/soubound items' options are inactive/greyed out in options. I would gladly use RR for auto getting rid of unusable stuff if only I could restrict it to soulbound items. Any BOE I could use on my alts. Also, account bound items (from rares or archy) - I wonder if they would get vendored as well if unusable on specific toon. I'll take another look today - but checking for BoE/Soulbound items is not so straightforward - there's no API from Blizzard to do so. I actually have to read in the tooltip and look for the word "soulbound." Last edited by natassja72 : 03-23-13 at 06:14 AM. Thanks for the bug report, it should be fixed in the next version. Last edited by CobraA1 : 08-28-12 at 04:29 AM. First beta of the next version of Reagent Restocker has been released. There's a lot of work to do yet, but I've fixed some of the showstopper bugs in Mists of Pandaria, and I've begun work on the new UI for shopkeepers that will replace the little "+" symbols that are in 2.6. Note that Reagent Resocker betas are only available from curse.com. Authors have been given their beta keys! I'll be doing my best to get back into coding Reagent Restocker again. Even if there's no major compatibility changes that need to be made, I'm starting to work on a new feature that will really help the overall usability of RR . General rule of thumb: All donations basically go to supporting this addon in some way or another. * Most donations basically go towards the WoW subscription and premium memberships at addon websites. * There is a new WoW addon development book, donations will go towards that. * Anything remaining donations goes towards making it easier to dedicate time to Reagent Restocker. If everybody who downloads gives even a minimal amount of money to their favorite addons every month or so, that would be great and do a lot for the addon community.